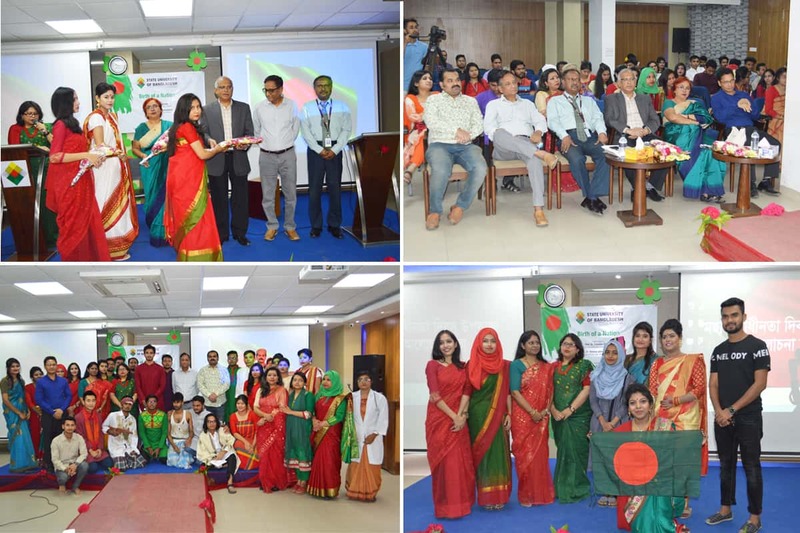 Department of English Studies organized a program titled Birth of a Nation on the occasion of 26th March at Scholars Inn of State University of Bangladesh. Prof. Tahmina Ahmed, Department of English, University of Dhaka graced the occasion as a Guest of Honour. Prof. Dr. Md. Sayeed Salam, Vice Chancellor, State University of Bangladesh presided over the programme. The program began with the welcoming speech by the Acting Head of the Department. Prof. Dr. Ifthekhar Ghani Chowdhury, the Hon’ble Treasurer, and Prof. Maj. Gen. Mohammad Quamruzzaman (Retd. ), the Registrar, Sahos Mostafiz, Acting Head, JCMS Department, Tania Taher Lata, Assistant Professor & Coordinator of Architecture Department and all the faculty members of the Department of English Studies attended the program. Prof. Tahmina Ahmed in her speech mentioned that we cannot afford to forget the heinous genocide of 26th March ’71 and reminded us of the contribution of the marginalized groups or subalterns in the liberation war. She pointed out a tendency among the people in power to ignore the sacrifices of these marginalized groups/ people made during the liberation war and the need to treat all freedom fighters equally with proper recognition. She also mentioned that the poets and teachers who participated in liberating the nation through their writings and bold speeches are unacknowledged. She emphasized the need of learning English in today’s world and added that more languages a person learns, the more powerful he/she becomes. Learning more languages makes us more competent and global citizens too. Prof. Dr. Ifthekhar Ghani Chowdhury, in his short speech, talked about the 9 months torture and struggle that resulted in the birth of this nation. He acknowledged English as a subject very close to his heart because of his great interest in literature, movies and the English writers. He encouraged students to participate in the cultural programs more and more and suggested students to organize a drama fest and perform some acts of the movie, “Shakespeare in love”. Hon’ble Vice Chancellor mentioned the need of more cultural activities in the Department of English Studies. He regrets the fact that we have not been able to achieve freedom in true sense. He encouraged the students to participate in the politics to build a brighter future of this nation and to become intellectual leaders. Later students from different batches performed Bangla patriotic songs, recited several poems both in Bangla and English, and also performed dances. The program ended with a dramp (drama+ramp) show which portrayed our liberation war.